From left: VP University Affairs Murdoch de Mooy, VP Student Life David Piraquive, President and VP External Caitlin McCutchen, and VP FInance & Operations Joseph Thorpe. It’s the start of a new era at the Kwantlen Student Association. A freshly-elected executive team took the reigns at the start of April and will be leading the KSA for the next year-long term. The association’s Womens Representative and Vice President External Caitlin McCutchen is succeeding Tanvir Singh as KSA President. Arts Representative David Piraquive is taking over for Jay Reedy as Vice President Student Life, while Queer Representative Joseph Thorpe takes Rawan Ramini’s place as Vice President Finance. Finally, former Arts Representative Murdoch de Mooy follows Singh as Vice President University Affairs. 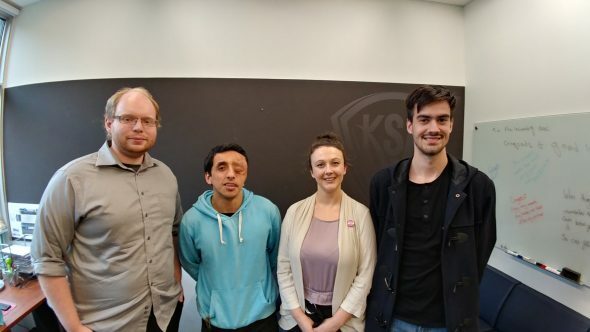 Members of the KSA executive team are the leaders and faces of the Kwantlen Student Association. KSA Council is made of candidates chosen via a university-wide student election in February. The Council then elects the four members of the executive team who hold a meeting to appoint a new president from amongst themselves. Interestingly, de Mooy was elected to an executive position by Council despite not being reelected by the student body as an Arts Representative in the February election. De Mooy still holds a position on Council, however, as a student representative on KPU’s Senate. This arrangement, while unusual, is not without precedent, as previous student senators in 2011 and 2013 have also served on the executive committee while not holding Council positions. As VP University Affairs, de Mooy wants to bring more transparency to the KSA and to KPU. He says that he wants students to be more aware of how the university and student association work behind the scenes. To that end, de Mooy’s first few days as an executive have been dedicated to setting up meetings with university administration and faculty. McCutchen is the only member of the team that is returning to her position as Vice President. Her plans for the coming term include getting started on negotiations relating to student health, student dental plans, and the upcoming tri-annual KSA Upass referendum. She also plans to be heavily involved in the university’s early planning for student residences now that the province has pledged funds for on-campus student housing. McCutchen has been passionate about advocating for this in her various roles in the KSA and the Alliance of BC Students. McCutchen says that her biggest challenge in stepping into the role of President is how different it will be compared to her role as VP External. In that position, McCutchen became familiar with looking outward from the KSA at its relations with other groups, while being the President is more focused on the internal systems of the KSA. This should be a smooth transition for the new President, however, as her experience as a councilor gives her an institutional background with the association. As VP Finance, Thorpe says that he’s most looking forward to creating new awards to offer students, particularly aimed at minority groups that don’t yet have dedicated awards. He is also interested in creating new initiatives to give students financial support, such as emergency funding, and planning the construction of the KSA’s future student union building. Thorpe has spent his first few days as VP Finance familiarizing himself with the budget and learning the KSA’s computer and internal systems. He says that the outgoing VP Finance, Rawan Ramini, has been there every step of the way to guide him in this process. Piraquive says that he wants to use his position as VP Student Life to help students at KPU become more engaged with on-campus culture. He wants students to be more aware of the services that the KSA offers, adding that, under his tenure, events will be happening more frequently on campus.